Welcome to my post today for Lily Pad's first birthday! 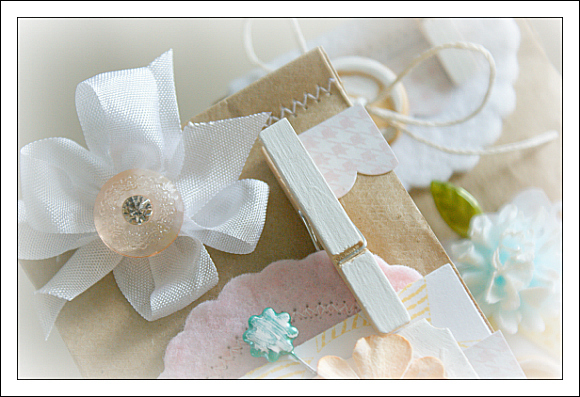 The Craft's Meow is sponsoring a few wonderful prizes, so be sure to check out the birthday blog hop! The fun starts here. 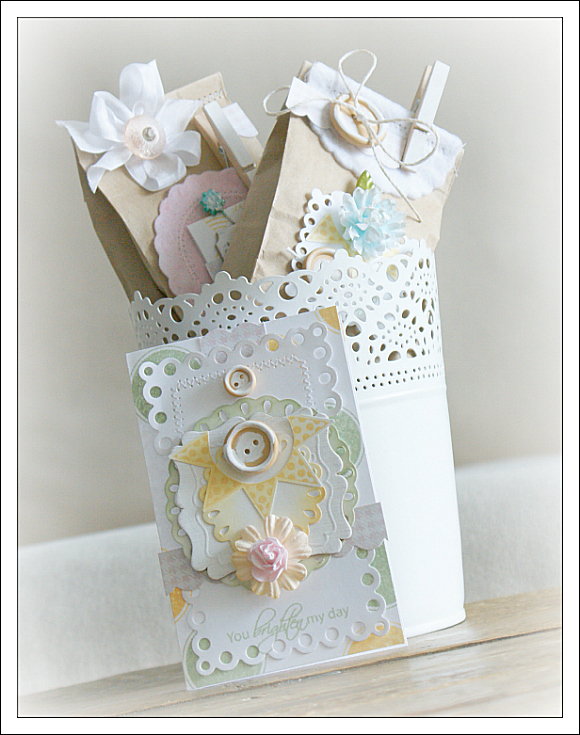 For the birthday theme, I've created little favor baggies, which are essential for any birthday celebration! And a little card to go along with. Not a birthday card, but nonetheless, it was fun to put together! 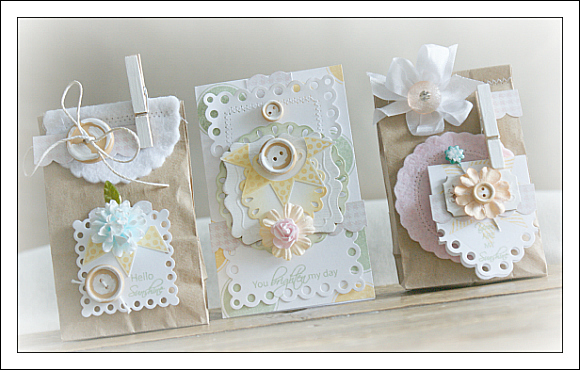 For this trio, I've used the Baggin Some Rays stamp set from TCM along with many other little toppings. When I think of birthdays, I think of happiness and sunshine! Hence my use of these lovely stamps! I know that every time I reach for my TCM stamps, I am completely inspired. There is something to be said about stamping, and the way it encourages full reign over the creative process. I love inking up my stamps with different colors, cutting out the images and layering them, and stamping various backgrounds, to create something new every time. 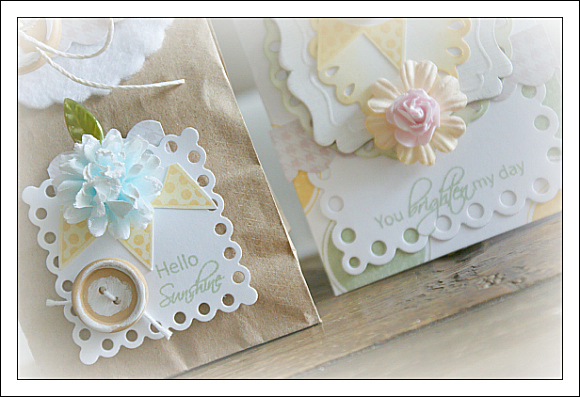 For the card background, I used the sun centers in the stamp set to create a multi-colored, large polka-dot design. I used the same green and yellow ink and stamped the sentiment on the pretty die-cut and the sun on a piece of cardstock, which I then cut out. A couple of the die-cut pieces started out white, but I added a splash of color with my Distress Inks and my blending tool. 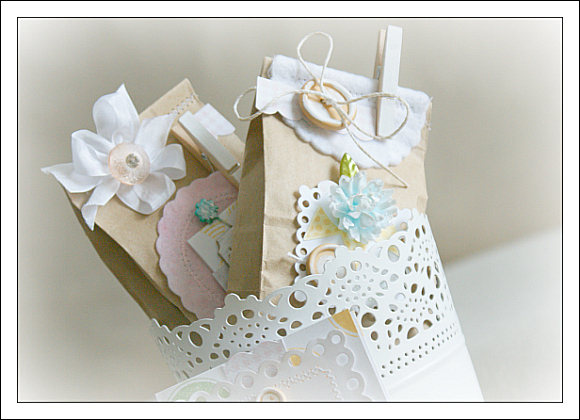 Next up, the birthday favor baggies. These would be so fun to stuff with candies, home-made treats or even tiny toys for the little ones. I used a combination of felt and paper die-cuts and decorated them with stamped images, flowers and buttons. The other baggie got the same treatment, with a touch of hand-dyed felt, stamped and die-cut cardstock and a painted clothespin. A few more accents like pretty vintage pins and sparkler buttons, and these favors are ready for a birthday bash to remember! 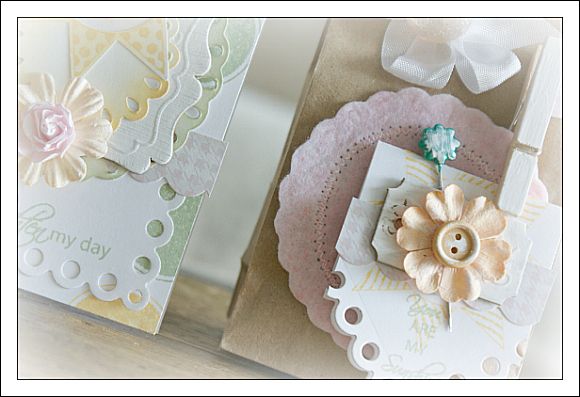 If you would like to see more creations and a chance to win some TCM stamps, check out the blog hop at Lily Pad! This set is so pretty! 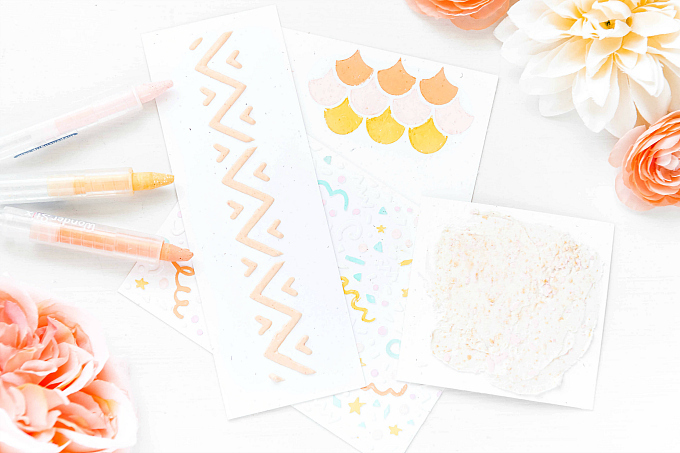 Love the stamps and how you customized your colors. As always beautiful work, love all the little details that make this your work. Gorgeous... and don't you love those tin containers. Ivana, these are beautiful precious creations!! I LOVE everything about these items! Wowwww and their base is white, love it :) Wishing you all the best for your wedding, the preparations, and such ya! !